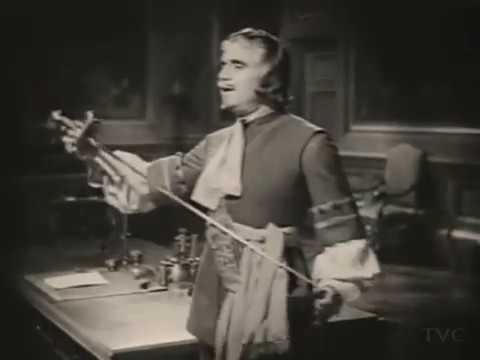 It’s 1638, and while King Louis XIII (Rolfe Sedan) anxiously awaits the birth of his heir to the throne, D’Artagnan (Douglas Fairbanks), one of the legendary Musketeers, is wooing Constance (Marguerite De La Motte), one of the expectant Queen’s ladies-in-waiting. It’s Constance’s bad luck to be present at the birth, not because it’s an unsuccessful one but because the Queen gives birth to identical twins, which the wily Cardinal Richelieu (Nigel De Brulier, repeating his role from 1921’s The Three Musketeers) considers the potential source for a future revolution. Richelieu decides that one of the twins must be spirited away to Spain and its existence never acknowledged. Unfortunately, as Constance was present at the birth, it means that she too must be spirited away, not to the sunny climes of Spain but the dreary confines of a convent. Naturally, D’Artagnan isn’t too thrilled when he learns that Constance has been abducted, and pauses his carousing with fellow Musketeers Porthos (Stanley Standford), Athos (Leon Barry), and Aramis (Gino Corrado) long enough to launch a rescue mission. Unfortunately not only does his rescue attempt result in the death of Constance at the hands of the evil MiLady De Winter (Dorothy Revier), but his open defiance of the Richelieu’s orders also results in the disbanding of the Three Musketeers. Only D’Artagnan’s close relationship with the King prevents him from suffering a worse fate. To be honest, you can’t blame the counterfeit King from being a little bit ticked off. After all, he’s been denied his birth-right as at least a prince and, as he so acidly points out, he might well be the older of the two and therefore the true king. He doesn’t have to be so graceless about it all though, and the decision to conceal the real King Louis’ identity by having his head encased in an iron mask ensures that he receives no audience sympathy whatsoever. On the other side of the divide, the Musketeers are a largely passive bunch, reacting only to the exploits of the villains rather than acting to prevent them from performing their evil deeds. After all, surely someone must have noticed that the second twin had been kidnapped by De Rochefort’s men. The Musketeers also have the disconcerting habit of sleeping together in one large bed under their famous motto ‘all for one and one for all,’ which sort of adds a whole new slant to its meaning. 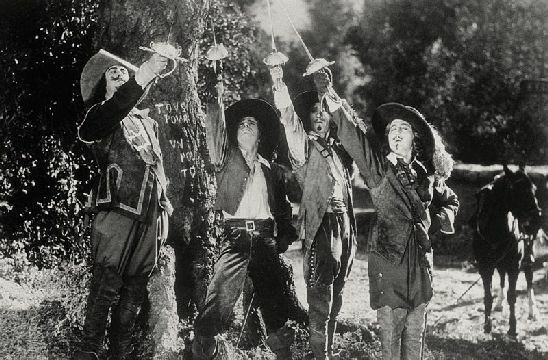 Retrospectively looked upon as the last hurrah of the silent era (even though it contains a couple of stagy sound inserts in which Fairbanks rather stiltedly recites a brief monologue), The Iron Mask provides a prime example of just how fast-moving a silent movie could be when unhampered by a surfeit of title cards. Although he was growing a little long in the tooth for such athletic roles (he was 46 when the film was released), and there aren’t as many action scenes as one might expect, Fairbanks has lost none of the dash and elan of his youth and makes a charismatic leading man. The plot is really two in one, being a blending of Alexandre Dumas’ novels The Three Musketeers and The Vicomte de Bragalonne: 10 Years Later, and while the join would be highly visible even without Fairbanks’ mid-movie monologue, it isn’t so jarring as to spoil the audience’s enjoyment, and makes a fitting finale to the silent action genre.